Corpus Christi plays were big community productions, performed in town centres on special occasions. What other kinds of plays do we know about? Not all early drama drew on the Bible: morality plays such as Mankind (written c. 1470) and Everyman (c. 1520) dramatised general issues about how to live a morally good life in contemporary society. As part of our festival Theatrum Mundi in July 2016, we invited PLS of Toronto to perform a version of Mankind in the market square in Durham, reproducing the type of performance in a civic space that would have been familiar to audiences hundreds of years ago. This was a general term used for all kinds of short plays, which often raised topical issues about politics and class. One is Nature, by Henry Medwall (c. 1500): this photograph shows the title character in a 2001 production by Durham Medieval Theatre. These are also recorded in many places. In the sixteenth century classically-influenced tragedies and comedies were also performed. Many plays have not survived, and we can’t know exactly what they were about, but the surviving records do show a thriving theatrical culture in the north-east and elsewhere. Where were they performed? Sometimes in public spaces such as market places: one of the town accounts from Beverley records a play being announced in the market place, so it was probably performed there too. Et in pane & ceruisia datis hominibus de Cotyngham post proclamacionem ludi sui in Communi Mercato ville ix d.
And 9 d. spent on bread and beer for the men of Cottingham after their play was announced in the town market place. 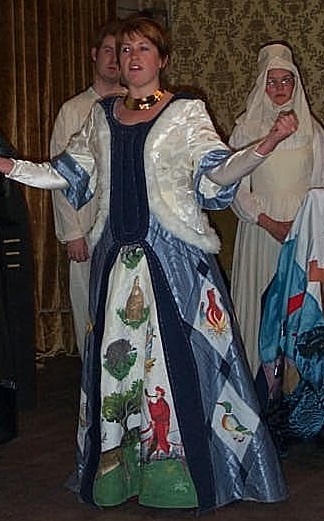 Some records show town councils inviting players to give private performances for them and their guests, but the great houses of the nobility also hosted many performances by actors, musicians and other performers. In the north-east, we are lucky that books compiled in some great households, recording payments to visiting companies of actors and house-hold staff including musicians, have survived: the Household Books of the Fifth Earl of Northumberland (c.1515) give very detailed records of daily routine and festive occasions in the Fifth Earl’s castles in Northumberland (Alnwick) and in the East Riding of Yorkshire: Leconfield (now demolished), and Wressle, near Howden. Not only locally-produced plays and music but a great variety of other kinds of performances appear in the records of the North-East: jugglers, minstrels, performing bears, dancers and even a tight-rope walker are found. Some were based in our region, others passing through north-eastern towns on tour, but all add to the richness of our cultural heritage. Robert Walssh, was paid by Durham Priory for accompanying the harvesters at Billingham, Co. Durham in 1495. Item: paid to Robert Walsh for two days’ playing, 8 pence. Priory to any performer in two centuries. Was his act thought to be obscene, and the low payment meant to discourage him? We may never know, but it is a fascinating question! Performing bears were at the centre of a court case in Beverley, East Yorkshire, in 1522, when John Grene, the Earl of Northumberland’s bear-ward (keeper of bears), was alleged to have insulted a man who interfered with his performance. John Grene was ‘baiting’ his bears by setting dogs on them to make them ‘dance’ and fight back: the sort of spectator sport that shocks us now, but which was popular everywhere in past centuries. Dancing also features in the records. Records in the North-East also show that the Prior of Durham once employed a fool, ‘Thomas Fatuus’ – literally, Tom Fool – who may have been a professional dancer, judging by the number of payments for new slippers for him recorded in the accounts from 1330-1340. 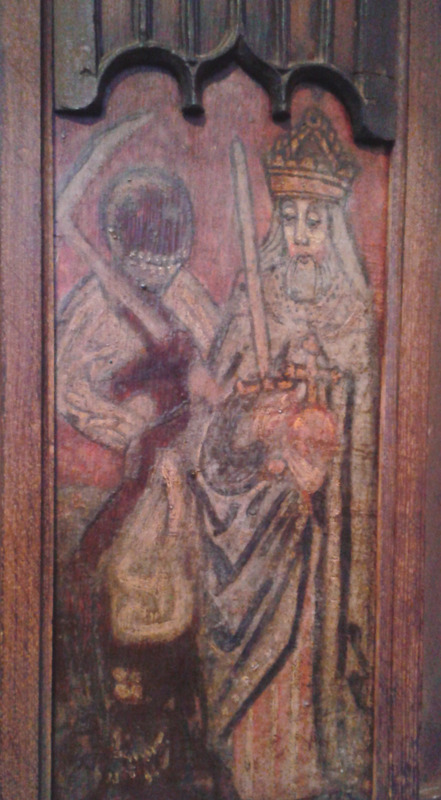 Death and a cardinal: painting from Hexham Abbey. Photograph © Mike Quinn, www.geograph.org.uk/photo/738833 under Creative Commons licence. Less appealing perhaps, but certainly intriguing, is the tradition of the Dance of Death or Danse Macabre, found all over Europe and vividly represented in paintings like this from Hexham Abbey, Northumberland. Traditionally, Death is shown ‘dancing’ representatives of all classes, ranks and occupations to their death – kings, queens and cardinals as well as more humble people, men and women, old and young. The Dance made the moral point that however powerful in life, we all die in the end; the warning should urge us all to live a good life. There is some evidence that the dance was not only shown in paintings like this, but also sometimes enacted.